The following text was written by students from Mülheim in Germany about how the coming of the New Year is celebrated there. On other pages of this website, you will also find some information on similar traditions in Spain. 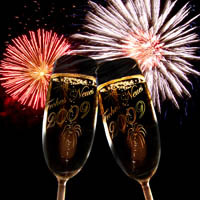 New Year's Eve is celebrated on 31 December, the final day of the year. In Germany, it's called "Silvester"; this name comes from Pope Silvester I, whose feast is on December 31. New Year's Eve is celebrated with parties and fireworks. 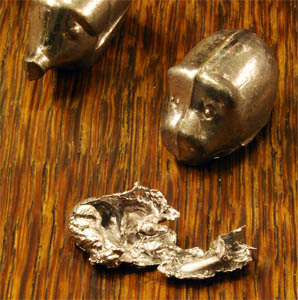 There is also the habit of "Bleigießen" on New Year's Eve, too: You melt a small piece of lead over a candle and then pour the liquid lead into a bowl of cold water. When you take it out you must look at the shape the lead has assumed and from that guess what is going to happen to you during the new year. Photo: Micha L. Rieser. Source: http://de.wikipedia.org/w/index.php?title=Datei:Bleigiessen-Ergebnis.jpg&filetimestamp=20081109202225. Copyright: see that page. A survey: Are the traditions still meaningful? In our survey we asked 79 15- to 20-year olds about New Year's Eve. Every one of them celebrates this event; a little under half of them celebrate with friends, 12 % with their family, and 38 % with various people. 80 % buy fireworks every year, 12 % only sometimes, and only 9 % never buy them. 21 % spend up to 10 Euros on fireworks; it was surprising that 20 % said they spent more than 50 Euros on it. Obviously rockets and other firework are a necessary ingredient of New Year's Eve. For 42 %, the way they celebrate the end of the year has not changed over recent years, while 34 % say it has. They stated that they now celebrate with friends instead of their families, that they return home later and now drink alcohol. We guess that these changes are due to the age of the people we asked, since young people celebrate differently from children or their parents. When we asked if they found New Year's Eve a meaningful way of ending the year, more than half of those taking part in the survey answered "very meaningful" and 28 % "fairly meaningful". Only 4 % do not think it makes sense. Therefore we can say that New Year's Eve is popular with almost all participants. Unfortunately nobody knew that the German term "Silvester" for New Year's Eve is derived from the name of Pope Silvester. When we asked what the origin of the celebrations was, almost everybody answered that the origin lay in China and that the fireworks were originally intended to drive away evil spirits. Finally we asked the question whether people would prefer to have New Year's Eve in the summer. To this more than half of those taking part answered in the negative; 10 % would like it, whereas 22 % did not really care. Therefore we think that New Year's Eve simply belongs to the cold season and that hardly anyone can imagine it being in summer.